By now, everybody has heard about the historic victory for marriage equality in New York. Late on Friday, June 24, the New York State Senate passed this important piece of legislation and the Governor promptly signed it into law. A big win for progressives and for an important cause! One major reason this success was so meaningful beyond state borders was because the Human Rights Campaign effectively engaged marriage equality supporters everywhere, not just in New York. But how do you build a groundswell of support for a state-specific issue where only the state’s residents can directly advocate with state legislators – and then how do you capitalize on your victory? Partnering with longtime client HRC, M+R proudly took on this challenge to generate some awesome results. Now more than ever, individuals are connected to one other across state (and even country!) lines. We tapped into these personal networks to keep the pressure on in New York with a “Tell-a-New-Yorker” campaign. 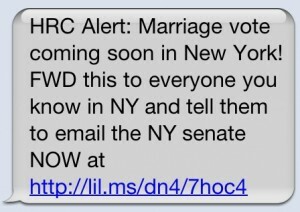 The first component was a text message sent to HRC’s broad Mobile Action Network, suggesting that they ask their friends in New York to contact their state senators and demand that they vote for the marriage equality bill. Legislative battles take time, and it can be tough to hold people’s attention around the issue – especially when the battle isn’t being waged on every supporter’s home turf. To keep the momentum going, HRC shared video of everyday New Yorkers with supporters nationwide, encouraging them to share it with their friends within New York. Folks shared the news on Facebook, Twitter, and in a tell-a-friend email, helping get even more New Yorkers involved in the fight. Out-of-staters may not feel compelled to donate directly to in-state electeds, but supporters anywhere can still help influence public opinion by opening their wallets. One way HRC and the pro-equality coalition New Yorkers United for Marriage engaged Americans outside of the Empire State was by asking supporters nationwide to pitch in and help HRC fund TV ads to be aired in New York markets, targeting both constituents and undecided legislators. People care what’s going on all around the country – not just in their home states. HRC looped in supporters around the U.S. by launching a heartfelt victory email to their online subscribers, along with a text message broadcast to their Mobile Action Network the moment the vote became official. HRC’s email was one of the first to arrive in inboxes declaring victory and thanking supporters for their role in making it happen. 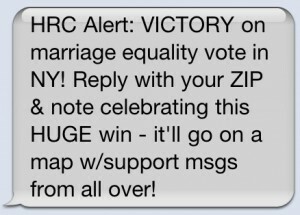 To visually demonstrate the far-reaching support for this state fight, HRC announced that anyone could text in feel-good messages of support for marriage equality in New York to be displayed on a map of the United States. Over 18,000 supporters sent in messages, most of them from outside New York, painting a beautiful, national picture of grassroots support for this momentous occasion. Built in coordination with Mobile Commons, the text-in map served as a strong engagement tool around a major issue. Engaging your supporters on state battles can get your full base revved up and ready to help you tackle the next challenge, whether it’s a small, local case or a nationwide campaign to change outdated, discriminatory laws.